Martin Lewis, of moneysavingexpert.com fame, started an e-petition to the British government: “Make financial education a compulsory part of the school curriculum”. To see the petition, now closed, click >>HERE<<. The petition successfully exceeded the 100,000 needed to be considered for debate in Parliament. The higher the number of signatures, the harder it will be for MPs with their ignominious record of failing to legislate against rip-offs to consider and reject debating this in parliament. We share an objective with Martin Lewis. The objective: to build financial capability among Britons, and make them less ripped-off. This is a struggle on many fronts, but none more fundamentally important and potentially effective than education in schools. Astute young people protect themselves, their friends and relatives, and later their own children - creating a virtuous circle. The rippers-off come from all sectors – energy, telecoms, retail – but they are lead by the example set by the financial services industry. They rip off because it is profitable and they rarely suffer any significant sanction. 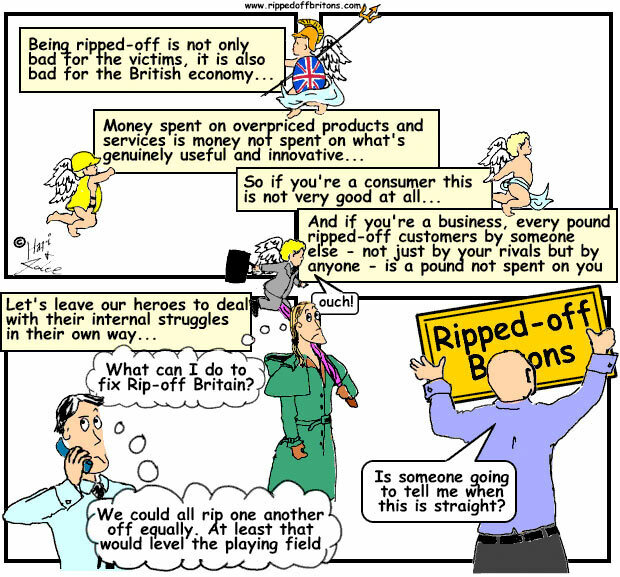 The most effective sanction could be applied by educating the customers to see and understand how they are being ripped off - customers turning away and rejecting the deals because they can spot the rip-off in the first place. The banks and insurers spend great fortunes on building trust with us Britons. They are already going into schools to build trust with the children, explaining why it’s a good idea to save, to borrow, and to insure. But unsurprisingly they fail to drum into the little darlings how to spot and avoid the rip-offs. Though excessive fund charges can swipe upto 50% of your investment, leaving you in poverty in spite of a lifetime’s saving. And if you are not eternally vigilant, your savings accounts with tempting "bait" rates are sure to drop to a measly 0.1%. Except when you are tempted into taking on excessive debt by continual hikes in your credit card limit. Or by low teaser rates, that then jump up after a few months to strangle your finances. Unless you are sold insurance that it is impossible for you to claim on. Building trust is their first step. “My word is my bond”, the banker’s lofty statement as he looks you straight in the eye, appealing for your trust. “Trust me and take me at my word. If I say it is a great product, then you can assume it is, so just sign here”. Make no mistake - Financial Services and other industries will look you straight in the eye, and then poke a sharp stick into it to try and pinch your eyeball. “Expose a suspicious activity, such as Payment Protection Insurance, and you may rescue a man from yesterday’s scam. Teach the man to understand and to be suspicious, and you rescue him from a lifetime of scams”. Suspicion is an ugly word. In the consumer protection legislation the consumer has a responsibility to be "reasonably circumspect", a sweeter smelling term for suspicion. But it is suspicion that will be one of the most effective ways of building financial capability in the population. Which is why the responsibility for financial education in schools should absolutely not be in the hands of the financial community – not the industry, not the regulators. The industry is hardly going to put much effort into teaching people to treat them like the bunch of dodgy geezers they are. The regulators are hardly going to spend much time highlighting their inability to ensure good practice by the dodgy bunch they regulate. I would like to take the opportunity to make some personal remarks on the challenges the FCA faces. These words were spoken not by me but by Howard Davies, the first chairman of the FSA at the annual public meeting in 2003. These words are as true now as they were then. Eight years on, there is little or no evidence that any significant change has occurred in the attitude of the financial services industry towards its customers." "if it’s possible to make money out of gullible or unsuspecting customers, particularly institutional customers, [the banks think] that is perfectly acceptable”. If the Financial Services are determined not to reform, if the regulators are frustrated in their attempts to regulate, then the only thing separating Britons from the next rip-off is education and suspicion. “the general principle that consumers should take responsibility for their decisions”. A large segment of the population lack the numeracy, the literacy, or the attention span, to comprehend what is being sold to them. The industry has a specific strategy to offer products that are complex and that change surreptitiously. In addition, the main consumer protection legislation, the “Consumer Protection from Unfair Trading Regulations”, explicitly allows traders to rip off the “less than average” half of the population. "This appeal involved a relatively narrow issue. The Supreme Court had to decide not whether the banks’ charges for unauthorised overdrafts were fair but whether the OFT could launch an investigation into whether they were fair." British Supreme Court judgement in November 2009 on rip-off bank charges, in which the OFT having won its case through the High Court, ultimately lost in the Supreme Court. Therefore it was up to the customers to take responsibility for spotting, comprehending, and calculating the charges in the small-print. Two chairmen of the FSA, Davies and Sants, have stated that the industry has failed to learn from its past mis-selling. The Governor of the Bank of England points out that the banks believe it is acceptable to take advantage of the unwary. The FCA states that the customer must take responsibility for what they buy. The authorities are resigned, perhaps with regret and exasperation, to the predatory companies having a free hand, and put the responsibility on the prey (that’s us) to look after ourselves. The combination of predatory companies and of regulators and legislation puts the responsibility for not being ripped off on their prey! Sounds like an opportunity for more mis-selling. An opportunity the Financial Services, through their associations, their consortia and their patronage, hungrily nurture and protect. Anti Rip-off programmes already exist, like the BBC’s Watchdog. However, like newspapers, these highlight the latest rip-offs for one episode and then move on. In contrast, there are mountains of marketing materials, legions of salesmen, and hundreds of millions of pounds of budget devoted by the Financial Services and other industries to ripping us off. Materials that are broadcast and mailed by them obsessively, day in, day out. For customers to become capable of taking responsibility for their decisions, as the FCA requires them to, they need education. The most effective way to teach them is by entertaining them. Short, focussed, memorable, succinct – not unlike the myriad adverts paid for by the dodgy banks, energy companies, airlines, mobile phone sellers. It's not only the best way for them to be taught, but provides them with material they themselves can teach others with. Ripped-Off Britons aims to highlight scams pulled off by the pillars of British industry who operate within the letter of the law. Scams by the most respected and rewarded in the land that cause far wider and deeper harm than the activities of all the criminal fraudsters and conmen in the land put together. No organisation can do this by themselves. Our media are our cartoons in The Guardian and this blog. We invite guest contributions and suggestions - see our invitation by clicking HERE. As we mentioned in another post, the government has included financial education as part of Citizenship. While taking Citizenship is compulsory, taking the GCSE exam is not. 2012 figures show Citizenship (10,982 GCSEs awarded) sits between the non-compulsory study of the ancient Greeks and Romans (Classical Studies, 15,265 GCSEs) and Welsh as a second language (9,743 GCSEs). Not a subject taken seriously either by schools or students.